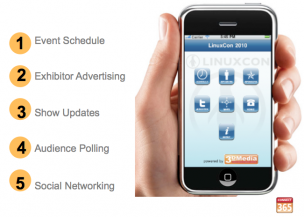 Who-What-Where-When - Mobile Connect™ Event Guide allows smart phone and iPad user’s immediate access to event information, including detailed event schedules, exhibitor listings, advertising promotions, outbound show management messages, audience polling and social media channels. Advertising Channels - There are multiple Mobile Connect™ advertising and sponsorship programs available. These include pull through banner ads and out bound exhibitor booth promotions. Maximizing Adoption - Mobile Connect™ is a web-based platform that works seamlessly on an iPhone, Android and Blackberry phones.